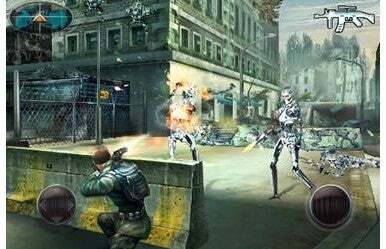 Gameloft on Thursday announced the release of Terminator Salvation for the iPhone and iPod touch. It costs $10. Terminator Salvation pits you against deadly robots in a post-apocalyptic future. Terminator Salvation follows the storyline of the upcoming blockbuster movie starring Christian Bale. It’s the latest in the long-running Terminator series, in which John Connor leads the human resistance against Skynet and an army of Terminator robots. Previewed by Macworld in April, the Terminator Salvation iPhone game pits you against T-800 Terminators, tanks, motorcycles and drones controlled by Skynet. You get an assault rifle, shotgun, grenade launcher, chaingun and other weapons to take down the enemy robots. Terminator Salvation requires iPhone 2.2.1 software update.